Premium users have unlimited push notifications which will be goverened by an acceptable use policy. VeraMate reserves the right to limit this service if it is being abused. 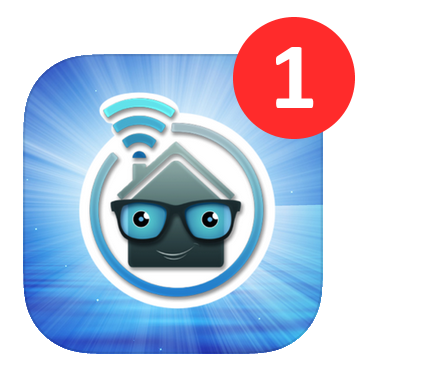 VeraMate Free users are limited to 2 push notifications per day. Apple's push notifications are not guaranteed by Apple - VeraMate accepts no responsability for failure to receive a message. Usage of VeraMate Alerts imply acceptance of these terms. What information does VeraMate record, how is it used, and how long is it stored? Information stored in VeraMate's database will only be used for the purposes of program functionality, which may be turned off by the user at any time. Data will be stored for up to 10 days, after which time it will be purged. The only personal identifying information which will be recorded will be the username, and the vera serial. Note: Don't get confused as there are 2 plugins involved here. 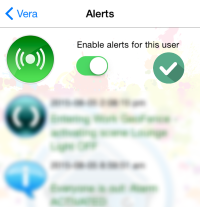 One from VeraMate (VeraMate Alerts Plugin), and one from a thirdparty (Vera Alerts) which hooks into Vera's notification system. There are 4 steps required to setup VeraMate Alerts. 1) Install the VeraMate Alerts Plugin on your vera. 2) On the VeraMate Alerts Plugin, specify the username you will wish to receive alerts - this can be comma delimited, and use "guest" if logged in as guest. (Done forget to press "change user"). 3) Open VeraMate, and under settings/alerts, enable push notifications. This FAQ is a work in progress, and more details will be being added over the coming days!